On the occasion of "Maggio dei Monumenti 1999" (when the city opens all its museums, galleries and sites of historical and artistic interest to the public), the church was re-opened to the public after fifty years. The restoration and consolidation work carried out by the Sovrintendenza for the Environment and Architecture of Naples and Province had been begun in the '70s. The church was returned to its original architecture, highlighting the trabeations and the Renaissance columns which had been hidden by the 19th-century stucco-work. San Severo was built in 1575 on the site of the old church and hospital Santa Maria a Selice, altered and restructured between 1599 and 1620 on a design by Gian Giacomo Conforto. 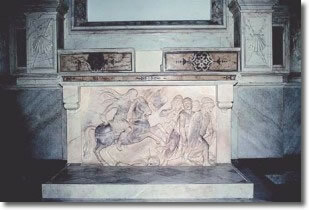 The interior has the architectural features typical of the 16th century, with 18th-century altars in polychrome marble. It is worth noting the sepulchral monument of Giovanni Alfonso Bisvallo, sculpted by Gerolamo D'Auria in 1617, dismembered by the 1688 earthquake and restored in the 18th century in the right transept altar. The availability of the church, which is of Naples Commune property, is ensured by the Servizio Patrimonio Artistico e Museale della IX Direzione Centrale politiche Culturali of the Commune of Naples, with staff of the Commune and "socially useful" workers. The precious aisle houses concerts, temporary exhibitions and cultural events consonant with the style of the church. From Monday to Saturday 10 am - 7 pm.